Nick Voronin in his previous life and today. 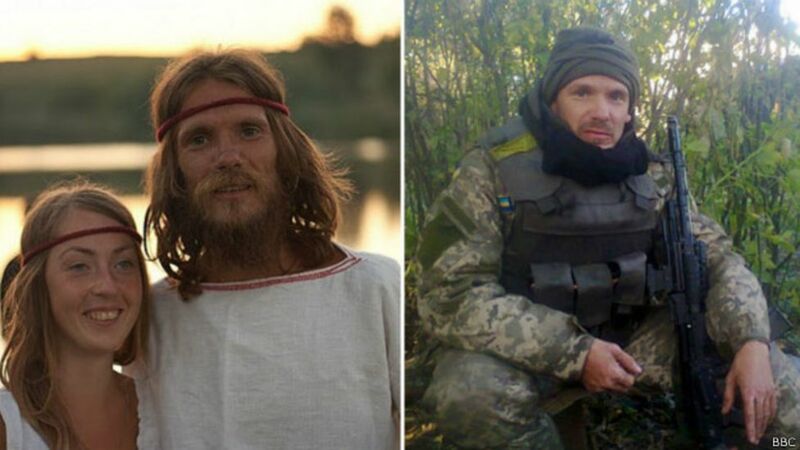 Just a few years ago he was known in the narrow circle of eccentric-pacifists who dreamed of saving the Earth from ecological disaster, was engaged in spiritual practice, lived with his wife in a self-dug out “hole” in a field in Donbas, caring for animals and eating roots and grass. Prior to this, there was education in a prestigious university, cancer and three complex operations. 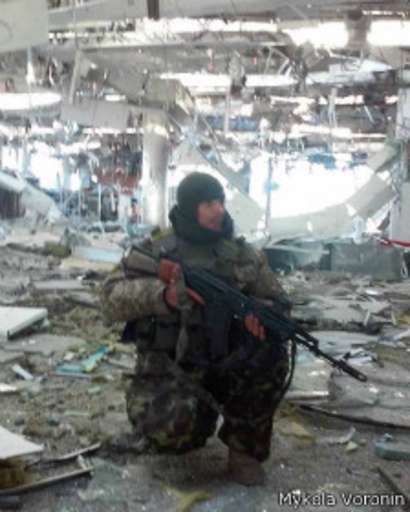 Today, 34-year-old Nick [Mykola] Voronin, a native of Kherson region – is one of the “cyborgs” that protect the Donetsk airport. He honors the orders of command, even if he doesn’t agree with them, he’s mastered the tactics, learned to practice with weapons and affectionately calls his automatic “Saniok” [a diminutive nickname from Oleksandr]. Although, he says he would be happy to part with it forever. He says that if he had been told a year ago that he would fight in the war, he would never have believed it. In 2004, when Nick graduated as an ecologist from the Kyiv-Mohyla Academy, he discovered he had renal cell carcinoma, which metastasized to his liver. The pain was unbearable. “There is nothing to compare it with. Each inhale and exhale for me was a feat. You can’t eat anything either, because it is very painful. You can’t drink anything. The pain is everywhere. You don’t sleep, because it hurts. It’s hell on earth” – he recalls. Having survived three operations, the money for which was collected throughout the university, Nick lost several internal organs, and with them the disease. In Ukraine, the Orange Revolution had started [November 2004 to January 2005]. Feeling that on the street something extraordinary was happening, Nick prematurely discharged himself from the hospital and, with his stitches still fresh, joined the protests. And, very soon, Maidan–2004 left a “difficult trail of disappointment” behind it. “I saw there the dreamers, the geniuses, and the vultures.” – says Nick. Healing himself, Nick, as a diplomaed environmentalist, set himself an ambitious goal – to heal the Earth from ecological crisis. But how? World renowned environmentalists, with whom he spoke at international conferences, did not give clear advice. Surprisingly, the answer to the question how to save the planet came from the works of Russian writer Vladimir Megre, the author of the Ringing Cedars of Russia series of books. Nick took the writer’s ideas as a call to action. Waiting until spring, he broke ground for his family estate near Horlivka. It was a strip of field 13 km from the city. His lawyer wife helped to formulate the documents for the land division, [she was] “also turned on to these ideas,” in Nick’s words. To Horlivka, where he worked as a teacher of mathematics in vocational schools, he traveled by bicycle. Outside it was warm, and the young family settled into a tent. But a problem appeared – a goat with its kid began to visit their simple abode, it had been given to them by friends. The animals constantly trampled the tent and soiled it. It led to building a different dwelling, closed to goats. 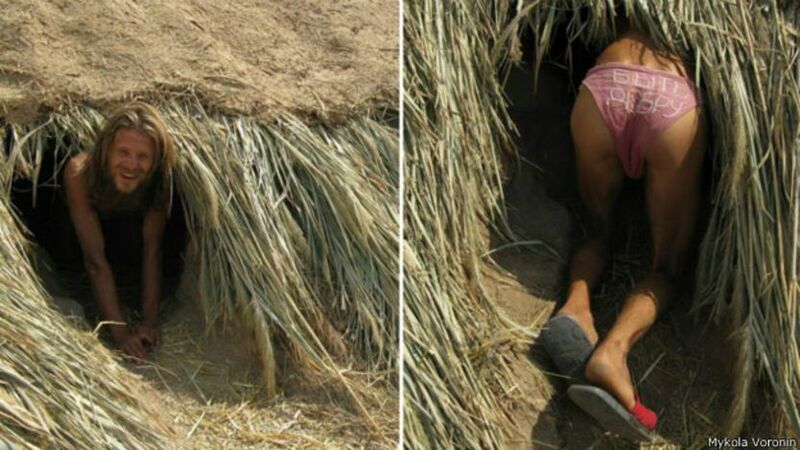 Then Nicholas dug a tight dugout, with a height of just above the knee, which he called a “hole.” Later on the hole grew thick earthen walls and a roof covered with clay and straw. Inside there was a small stove. The couple lived all winter in this dugout. The stove smoked so much that warming oneself from it was impractical, so they had to huddle against the cat and dog who lived with them. The cat was also needed in order to catch the mice, which, as it turned out, bite. The couple spent eight months in such circumstances – until the end of February. Most of the time they lived without money, eating only what nature gave: grass roots. In this way, they tried to disconnect from “civilization,” said Nick, with a gesture of putting quotation marks around the word. The most memorable were the nights spent in the ground – with these deep and ‘global,’ as he says, dreams. Despite the cold, his health has always been more-or-less good. Only occasionally did is surviving kidney hurt. At that time Nick, inspired by the books of Vladimir Megre and Slavic cults, was fond of the idea of the unification of Ukraine and Russia into a United Russia. When a new Maidan began in 2013, he treated it with suspicion and initially went to the pro-Russian meeting beneath the walls of the Donetsk Regional State Administration. But [because of] a disturbing atmosphere and conflicts amongst “their own” he immediately did not like it. Then something happened that finally convinced him of the necessity to take up arms, the separatists, he retells, captured his 17-year-old friend from Horlivka and abused him. Nick, who a year ago still considered himself a pacifist and quarreled with hunters who shot game on his estate, enlisted in the Donbas Battalion. Subsequently, he went to serve in a regular airmobile unit. Experiencing life in a dugout became opportune in war. Nick explains that he can go without food for a week, not sleep for several days and endure the pain. I ask what he has learned in war. After a short vacation leave, Nick Voronin returned to battle. 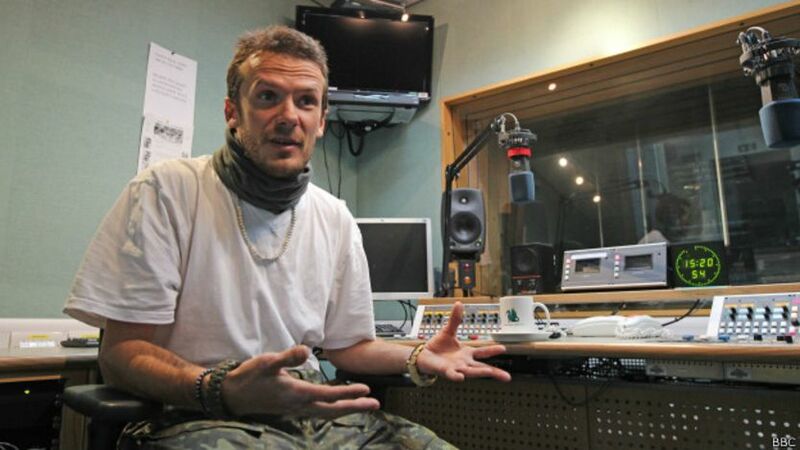 Nick says he loves all people, including his enemies, but does not respect them, because he cannot understand their views. This knowledge, says Nick, helps him in battle, because there, the purpose is very clear. This entry was posted in English, English News, Pictures, South&Eastern Ukraine, War in Donbas and tagged #RussiaInvadedUkraine, #UkraineUnderAttack, Donetsk, Donetsk Airport Cyborg, Nick Voronin, Ukraine, Ukrainian hero. Bookmark the permalink.